Your host Makiko is a true Tokyo native and lives in a beautiful, spacious townhouse in the residential neighborhood around Komazawa Olympic Park. Makiko values fresh, seasonal, traditional Japanese ingredients sourced locally and uses them in her dishes to add distinctive flavor to her food. Join Makiko for a market tour of the local supermarket as well as the fish and vegetable shop and learn about essential Japanese ingredients that locals use in their everyday cooking before you experience a hands-on cooking lesson in Makiko's kitchen. This is a beautiful opportunity to learn from a local and return home with valuable knowledge on how to transform essential ingredients into creative flavorful dishes. Join Makiko for a private tour of the local supermarket as well as the fish and vegetable shop and learn how to shop like a real Tokyo native! After the tour, you will join Makiko in her kitchen for a hands-on cooking lesson of traditional-inspired, homemade Japanese dishes. Makiko will explain the cooking process in detail and share important tips about Japanese cooking that are not taught in recipe books. The cooking portion of your experience will take 1.5 – 2 hours depending on the number of people in your group. After the dishes have been cooked, you will sit down together at her dining table and enjoy the feast you helped prepare. Makiko is an expert on Japanese cuisine, so feel free to ask her anything about Japanese food and ingredients. 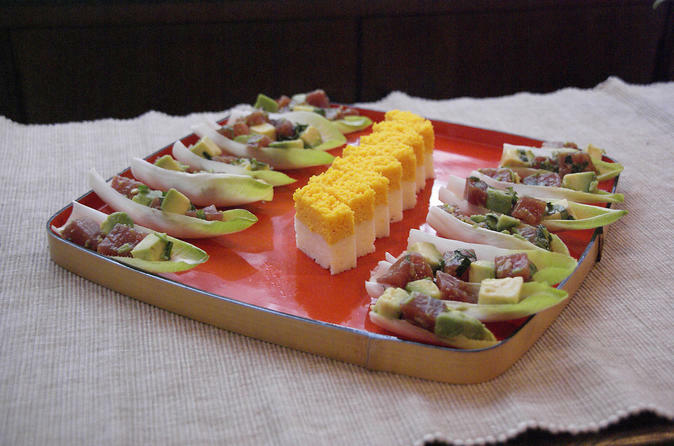 Don't miss out on this unique culinary experience with a Tokyo native in her beautiful home!